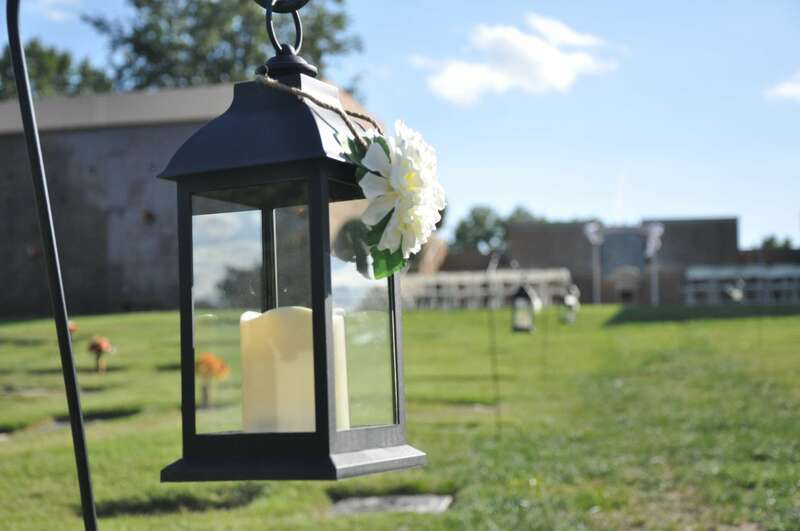 Even after over 83 years of service to families in our community, Baue Funerals, Crematory, and Cemetery experienced a first in hosting meaningful life ceremonies this September. St. Charles Memorial Gardens was honored to provide a setting of sincere romance and true intimacy for Kira and Aaron’s wedding ceremony. Kira Phelps and husband Aaron Hawkins celebrated their wedding with their closest friends, family, and even those most special loved ones who have passed too soon. This meaningful venue was inclusive of Kira’s father, brother, grandparents, great-grandparents, and cousin, as well as Aaron’s father and brother. 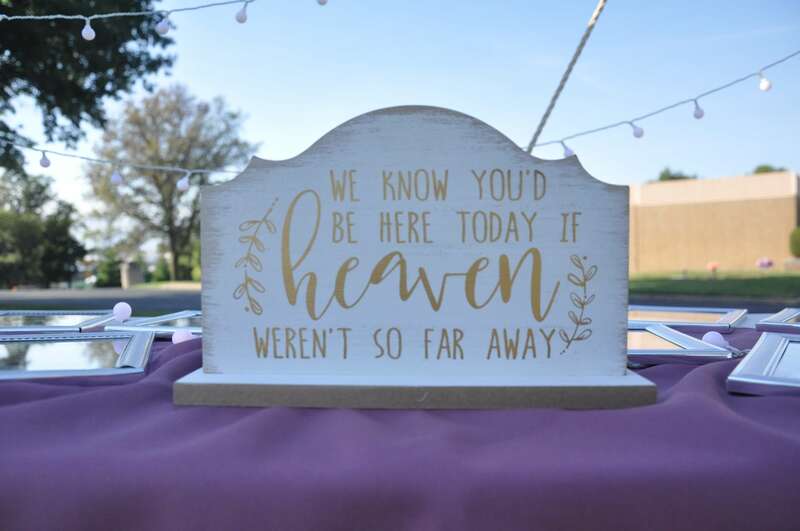 These honored guests and other dearly missed family members and friends will now not only be forever in the bride and groom’s hearts but in their memory of the first day of the rest of their lives together as husband and wife. Phelps’ father, Bryan Phelps, and brother, Tim Matousek, are rested in the Garden of Whispering Waters, where the ceremony was held. Hawkins’ father, Jeffery Hawkins and brother Nathan Hawkins are rested in the Garden of Prayer. Phelps, along with many who look forward to their wedding day, wanted to celebrate her special day with her father. “I couldn’t imagine doing this without my dad,” Phelps said. Though seeming impossible since her father had died, she and her friends thought of having the ceremony at St. Charles Memorial Gardens, in the Garden of Whispering Waters. The event circle at the center, and heart, of both families’ Gardens was romantically lit with dozens of warmly glowing string lights for the reception. 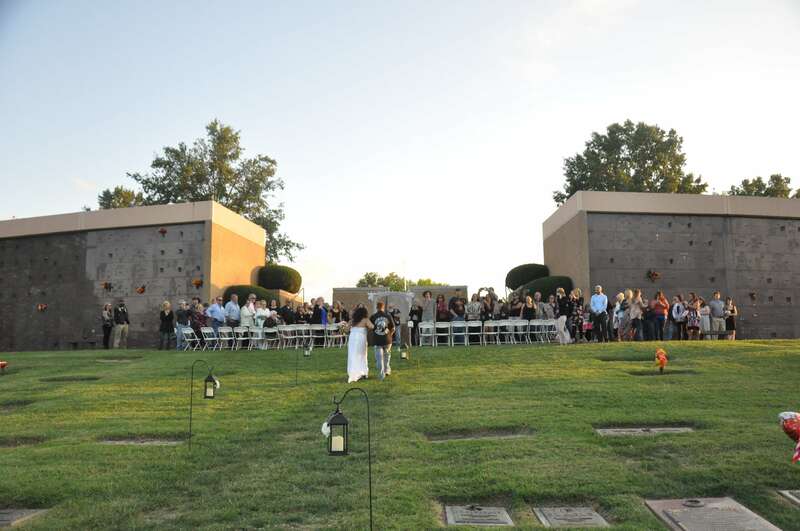 Not only was having the ceremony and reception in St. Charles Memorial Gardens special for Phelps and Hawkins, but also the date itself had significance. September 28th would have been Phelps’ father’s 60th birthday. Over 75 of Phelps and Hawkins’ family and friends joined in celebrating St. Charles Memorial Gardens’ first wedding ceremony and reception. The Gardens offer a symbol of eternal love as we will forever keep those we hold dearest in our hearts close to us, in both mind and spirit, as we continue through the adventures and journey of life. Kira and Aaron’s Ceremony provided the opportunity to have those close to them on their most special day.